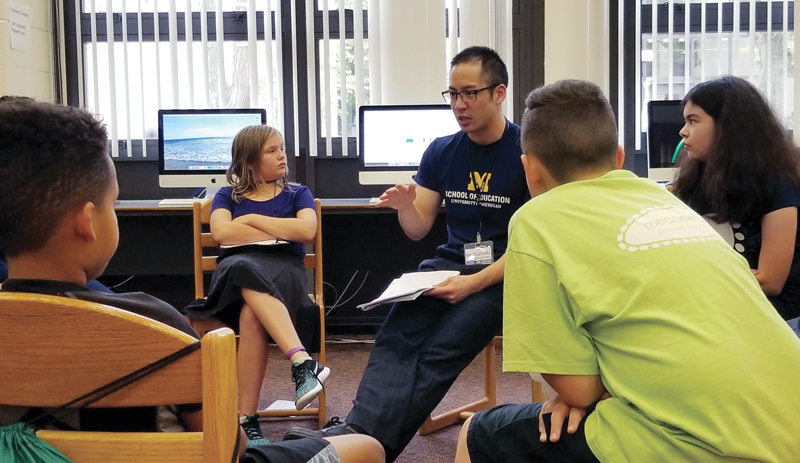 For the past five years, my teaching interns at the University of Michigan (UM) School of Education have spent four weeks teaching students at Ann Arbor’s Scarlett Middle School (above) about what it means to be safe, responsible, and respectful online. Utilizing curriculum from Common Sense Media and an original lesson based on the Stanford Graduate School of Education studies on media literacy, the interns help students create a positive approach to digital mental health by producing posting guidelines for their school community. In sixth grade, students learn about setting up positive and safe online profiles and creating strong passwords and privacy settings, and to be alert to scams, phishing, and predators online. They learn to friend and follow people they know in real life and what to do if they encounter a predator, scam, or uncomfortable situation. The seventh graders learn about media literacy: identifying fake news and manipulated information, evaluating a website or social media post for reliable sourcing, and tracing images using reverse image searching. Finally, they learn how to conduct a search using the deep web, with authoritative resources, journals, and websites. Eighth graders focus on empathy and civility—how to be become upstanders, using digital discourse for promoting positive relationships. While teaching, we learned a few things from the students. First, middle schoolers want to talk about their tech use and share stories. They’re looking for guidance beyond a simple "no” or “don't." Another surprise: students have their own personal rules about cyber conduct. While they may tell an adult that "I would never say anything mean online," they also shared, in our safe conversations, that they would be mean if someone was mean to them first. “The level of awareness younger students need to have regarding their online presence today is something I didn’t need to develop until I was nearly in college,” adds graduate student and student teaching intern Erin Gregory. Liz Kolb is a clinical associate professor at the University of Michigan’s School of Education. Hear more from her at the November 8 SLJ./ISTE Webcast Digital Citizenship for Tweens and Teens.